Faye Pilkington Parker Robinson, age 83, of Selma passed away on April 7, 2018 at the SECU Hospice House in Smithfield. 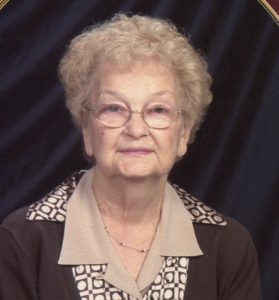 Born in Johnston County on July 6, 1934, she was the daughter of the late Albert and Ila Strickland Pilkington. Mrs. Robinson was preceded in death by two husbands, Troy Parker and Rev. Guy T. Robinson and her son Johnny Parker. She was a member of Johnston Community Church of God of Prophecy. Mrs. Robinson was very loving and devoted to her family and loved trips to the beach. The family will receive friends at Parrish Funeral Home in Selma Wednesday evening from 6 to 7 followed by a memorial service at 7:00 PM. Surviving are her children, Donnie Parker and wife Suzanne of Selma, Ronald Parker and wife Tanna of Statesville, Teresa Peele of Selma; step-daughters, Wanda Norris of Rockingham, Sharon Cox and husband Richard of Selma; a brother, Albert Pilkington, Jr. and wife Carline of Knightdale; a sister, Josephine Capps of Selma; nine grandchildren and eleven great grandchildren. Memorial contributions may be made to the SECU Hospice House, make checks to Johnston Health Foundation, PO Box 1376, Smithfield, NC 27577 or to Meal on Wheels, 1363 W. Market St., Smithfield, NC 27577.